Last modified on March 29th, 2018. Within a 'Tree Diagram,' select the entity you wish to remove. This will make the toolbar appear with applicable functions which can be used on the selected entity. Click the 'Remove' button to remove the entity from the diagram (as the default action). Within a ‘Tree Diagram,’ select the entity you wish to remove. This will make the toolbar appear with applicable functions which can be used on the selected entity. 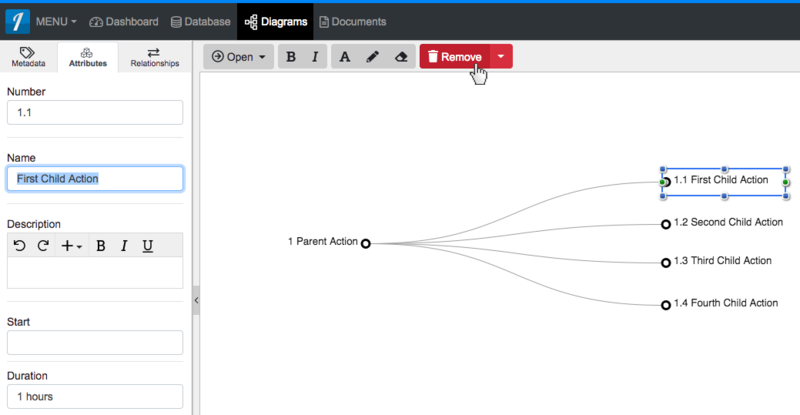 Click the ‘Remove’ button to remove the entity from the diagram (as the default action).